produced with Kill Screen for Vice and Experience Intel. Terra is a project designed to showcase the convertability of Ultrabooks (now it’s a laptop, now it’s a tablet!). It’s a laptop-flipping game of world-building and lawn-mowing. 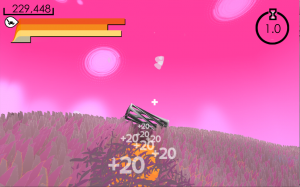 The game in played in two phases; first players use the touchscreen to sculpt a landscape, then they flip to laptop mode and have 45 seconds to drive around their world, mowing grass as they go. First and foremost Terra was designed to be accessible. As part of the worldwide Experience Intel showcase tour, Terra needed to be something people could pick up and start playing immediately. Our second goal was to really celebrate the devices’ conversion feature, giving people a magical and playful way to experience this fun new twist on a traditional laptop. But Terra is not just a hardware demo; beneath the approachable outer shell hides a surprisingly deep game of skill and strategy, for those interested in diving deeper. Grass at higher altitudes is worth more, but scaling steep heights brings the risk of catching air and breaking your combo. 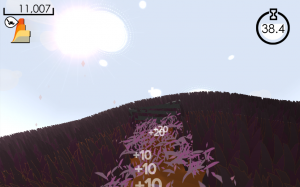 Hitting a high score requires both savvy landscape design and skillful driving. Terra was a rapid project made possible only by the efforts of an amazing group of collaborators and clients. With an aggressive deadline, complex constraints, and a brand new piece of technology to showcase, Terra allowed Hide&Seek New York to follow the fun to a whole new kind of game.